Sisters Cindy and Amy Giver. 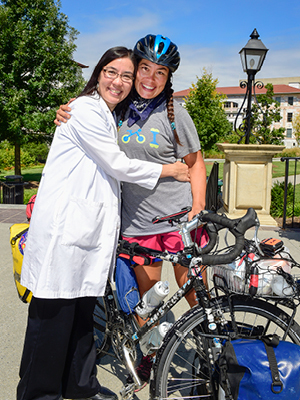 It took five months for Amy Giver to ride her bicycle, solo, from California to Atlanta. 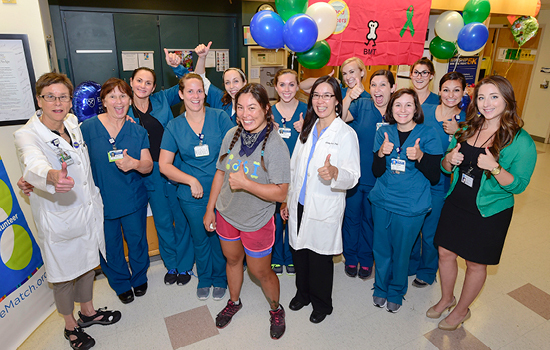 The physical trainer dedicated the ride to raising awareness about bone marrow donation and the Be The Match organization, so it was fitting that she wrapped up her ride at Winship's Bone Marrow Transplant unit in Emory University Hospital. Also fitting because her sister, Cindy Giver, is a Winship researcher whose work focuses on blood cancer and bone marrow transplant. The sisters had a happy reunion in front of the hospital and then went up to the BMT unit for a celebration with staff and patients. Amy hopes the Be The Match events she rallied around the country make people aware of the need for more donors in the national bone marrow donor registry, which matches unrelated donors to people with life-threatening blood cancers who need a bone marrow transplant. Atlanta TV icon reveals an "attitude of gratitude"
Winship's Executive Director, Wally Curran shares five reasons why he runs every year. Linking arms with the world's largest airline.